Monday's report from the nonpartisan Congressional Budget Office could give moderate senators concerned about health care coverage pause. Senate Republican Leader Mitch McConnell wants a vote on the bill this week, before senators head home for the Fourth of July recess. With Senate Democrats united in opposition, Republicans can afford to lose only two votes on their side and still pass the bill. Republican Sen. Dean Heller of Nevada, who is up for re-election next year, has already expressed reservations about the number of people who could lose coverage under the GOP bill. Four other Republican senators have complained that the bill doesn't go far enough in rolling back the Affordable Care Act, also known as Obamacare. The Senate bill would cut hundreds of billions of dollars in taxes over the coming decade, with most of the savings going to those at the top of the income ladder. At the same time, it would phase out the Affordable Care Act's Medicaid expansion, while offering less generous subsidies to those who purchase health insurance on the individual market. That combination is expected to reduce the number of people with insurance coverage by 22 million by 2026: Fifteen million fewer on Medicaid and 7 million fewer in the individual market. Over time, the bill would also make deep cuts to traditional Medicaid, the safety net program for the poor and people with disabilities. The program, which dates to the Great Society of the 1960s, covers nearly one in five Americans — more than Medicare, the better known program for the elderly. 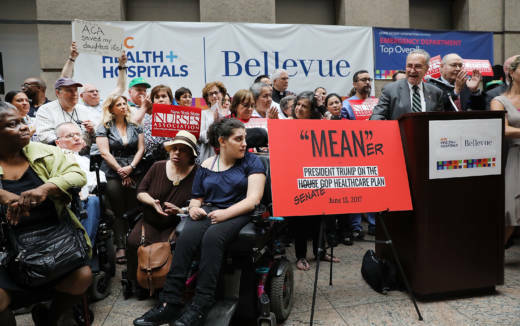 For the first time, the Senate bill would cap federal spending on Medicaid in 2020, forcing state governments to either scale back the program or make up the difference out of their own budgets. The Senate bill also assumes that after 2025, medical bills will grow more slowly than they have historically. If that assumption is wrong, states would face an even bigger budget gap that would grow with each passing year. Democratic Sen. Ron Wyden of Oregon worries the CBO report doesn't fully reflect those long-term effects, since congressional forecasters typically focus on a 10-year budget window. Wyden, the ranking Democrat on the Senate Finance Committee, wrote a letter to CBO Director Keith Hall, asking him to assess how the Senate bill would affect Medicaid coverage 20 or 30 years into the future. "It is critical that Senators completely understand legislation and its impact prior to casting a vote," Wyden wrote.